Preparation for preventing the spread of the flu and H1N1 (swine flu) is top-of-mind in housekeeping departments throughout the country. In addition to proper sanitizing and disinfecting, cleaners are focusing on promoting hand washing — especially in high-traffic facilities such as airports, schools, retail facilities and hospitals — as a method of pandemic prevention. Proper hand washing requires five steps. The first four are common sense: wet hands; apply soap; rub for 15 to 20 seconds; and rinse. It is the final step that many building occupants overlook as part of a proper hand hygiene program: dry hands. Paper towel and dispenser type, as well as their placement in the restroom, can encourage hand washing and prevent cross-contamination. But best practices vary by facility budget, demographic and a variety of other factors. Studies have shown that people won't wash their hands if there isn't a towel available, so custodial crews are making sure towel dispensers are fully stocked throughout the facility. To reduce stocking frequency — and subsequently labor hours — while encouraging hand washing for the 6,000 students in all 11 Dodge City, Kan., schools, Maintenance Supervisor Chris Meyer chooses roll towels for the restrooms. "About two years ago we went to roll towels instead of single-fold because we were stocking the single-fold four times a day and we found that if there were no towels, students won't wash their hands," says Meyer. "Now, because of the capacity of roll towels, we only have to restock every other day." With roll towels, the user takes only one or two at a time, not a bunch, says Meyer. He has found that the switch in towel type has regulated usage, reducing the need for constant restocking, and improved the cleanliness of the restroom. "Our restrooms are also staying cleaner and there are no corners, tears and half towels lying on the floor," he says. "There is a lot less waste and we experience efficiencies in labor." As budgets remain a focus point for all facility managers, labor hours and productivity will be closely scrutinized. Minimizing the time workers spend in the restroom can save valuable budget dollars by freeing up staff for other cleaning tasks. Meyer comments that by simply changing his towel dispenser, he has gained 10 to 15 minutes that staff can use to focus on duties other than restocking restrooms. These numbers can be expanded even more as managers consider implementing high-capacity towels. Most restrooms have a total of four to eight toilets (or urinals) with two sinks and two towel dispensers. To minimize stocking, Dave Daniels, director of buildings and grounds for West Ottawa School District in Holland, Mich., utilizes 800-foot towels and lever-action dispensers for 7,800 students in all 13 schools. The 800-foot roll towel is one of the highest capacity towels available on the market, but there are other options that vary in length to suit every facility. Meyer opts for the 600-foot rolls and mechanical dispensers that automatically forward towels when one is taken. These high-capacity options will expand the time between restocking, while providing ample supply for restroom patrons. Many facility managers have seen benefits to utilizing roll towels in their restrooms. Capacity alone reduces stocking and encourages building occupants to practice proper hand hygiene — a plus as H1N1 hits pandemic levels and flu season progresses. According to the Soap and Detergent Association (SDA), the general public seems to be embracing hand hygiene more today than in past years, but not all building occupants are cleaning their hands as well as they should. Although up from a disgraceful "C-minus" in 2008, the SDA reports that America's 2009 grade for hand hygiene is only a "B-minus." Some cleaning managers comment that the lack of hand hygiene has a direct correlation with the type of dispenser and the quality of towel, as well as its location in the restroom. And to encourage proper hand washing, managers address all three. Everett McDonald, housekeeping supervisor of the Cincinnati/Northern Kentucky International Airport in Cincinnati, has 9,000 visitors moving through his buildings every day. About a year ago — in an effort to reduce cross-contamination — the airport began switching all of its lever and pull-and-advance towel dispensing systems to electronic sensor-operated touch-free dispensing units. "The fewer things you touch, the less likely you are to pick up contaminants," McDonald explains. "Just wave your hand in front of the dispensers to advance the towel. They're pre-set for between 12 and 18 inches, so a person has enough towel to sufficiently dry their hands. Pull one and in five seconds another is ready to come down." Many facility managers are exploring the benefits of these touchless dispensers. Whether it's auto-advancing, sensor driven or a manual pull-down dispenser, reportedly, building occupants are more likely to wash their hands when touchless options are available. "Technically there is very little difference between manual automatic and electric automatic, but people feel safer not touching surfaces in a public restroom," says McDonald. "We currently use high-capacity automatic dispensers in the highest traffic areas and pull down C-fold towels in our lower traffic areas." Minimizing cross-contamination is a pro of automatic dispensing, according to Meyer, but the cons are a mechanical device that can break down and the size. 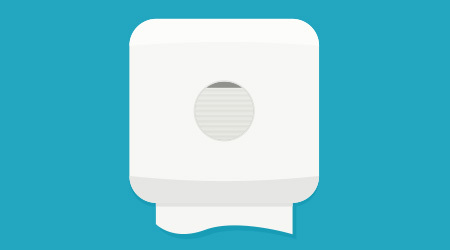 Many single-fold pull-down towel dispensers are about 10-inches tall, while a roll-towel dispenser averages up to 15 inches tall. The latter also comes further off the wall, making placement a challenge in some facilities. Cleaning managers have noticed that placement contributes to the flow to the restroom and will help drive proper hand hygiene practices. Reportedly, building occupants prefer to have towels available while either standing at the sink (within arms reach), or near the trash receptacle. "More than anything, we've found that placement of soap, towels and trash cans is important to the promotion of hand washing," says Meyer. "When soap and hand towel dispensers are right next to the sink, building occupants of all ages are more likely to wash their hands — across the board." Towel dispensers that are in close proximity to sinks will help keep restrooms clean by minimizing water on counters and floors. But, towels located here can increase the time restroom patrons spend in front of sinks/mirrors — a challenge for high-traffic facilities. This placement also requires patrons to find and use the closest trash receptacle — opening up the potential for trash left on counters and floors. Towels located away from sinks, but near receptacles, help maintain a steady flow in high-traffic facilities and improve the likelihood of paper ending up in the trash (as oppose to on the floor). But, the placement often requires patrons to walk across the room with wet hands, dripping water and causing hazards. In addition to placement, the type of towel offered can impact whether or not restroom patrons wash up after using the facilities. "We put more emphasis on towel friction and wiping away debris," says McDonald. "I'd describe our roll towel as a little above medium quality, but one that can withstand the necessary friction to properly dry hands. We're open to using towels with recycled content, but can't find one to meet our standards." Although he agrees that "natural" towels aren't always as absorbent, the environmental benefits drove Daniels to make the switch from bleached white towels three years ago and in all 13 schools. "Research has shown that people pull the lever three to four times regardless, and it doesn't necessarily matter what type of towel comes out," he says. "It seems like high recycled content isn't as absorbent, but people are still getting in and out of the restroom as fast as they use to. So, to do our part to help the environment, we now try to use as much recycled content as we can." In addition to the environment and functionality, Meyer focused on finances when making the decision to implement natural brown towels instead of white in his schools. "We made the switch because of economics, and because we feel that the application does a fine job on kids' hands," says Meyer. That said, demands from teachers and school administration resulted in the implementation of higher grade towels in the executive restrooms. McDonald adds that the type of soap used can also impact the effectiveness of the paper towels. Foam soaps may rinse off easier than creamer soaps, which could make a difference in the efficacy of the paper products. Whether it's due to the type of product, its placement within the restroom, or recent health scares, McDonald has seen an increase in hand hygiene among travelers of all ages passing through his airport. "Awareness of the H1N1 pandemic is probably a contributing factor," he says. "People who were reluctant to wash their hands before are washing now for their own personal safety."